But this is also possible toestablish #1 directly, without invoking the generalization of Bottema's theorem and, thus providing an alternative (and purely synthetic) proof of the latter. 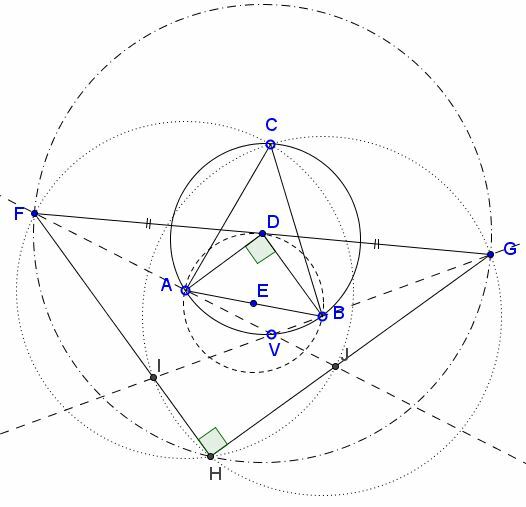 Indeed, due to Thales' theorem, the parallel to $GH$ through $A$ meets $FG$ at its midpoint $D$ but $BD$ is parallel with $FH$ therefore $\angle ADB$ is right and $D$ is on the circle with diameter $AB,$ as required. The appearance of point $V$ in the setup of the generalization of Bottema's theorem is due to Hubert Shutrick's insight that the generalization could be formulated without invoking rotations; points $I,J,H$ emerged in a follow-up investigation; their properties proved by Hubert Shutrick.